Metal Buildings for Sale | D.R. 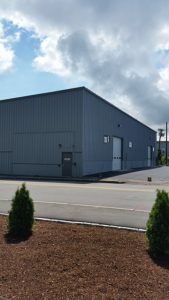 Poulin Construction, Inc.
Increasing numbers of retail, commercial, and industrial companies are looking for metal buildings for sale because of their efficiency, durability, and cost-efficiency. If you’re looking for metal buildings for sale, check our D.R. Poulin Construction – we’re the metal building specialists! We offer planning and design assistance throughout the whole metal building process. Today’s modern metal building systems offer more choices at an affordable cost than are possible with conventional buildings. That’s why, when companies become aware of metal buildings for sale, more and more are taking a long, hard look at a metal building and making the right choice to go metal. Here at D.R. Poulin we offer the industry’s finest metal buildings for sale – Kirby metal building systems. Kirby is known for quality, attractive appearance, and efficient space utilization. When a Kirby metal building for sale hits the market, it can get purchased quickly. What’s so great about a metal building? Pre-fabricated metal buildings can help you reduce the cost of time-consuming, traditional, custom-built construction. When we design and build metal buildings we can easily combine wood, brick, glass, stone masonry and other materials to customize the interior and exterior, creating a unique, cost-efficient building that perfectly fits your specific needs. The variety of materials we can provide will give your building a unique personality and provide the functionality and appearance you desire. Kirby Building Systems provide a wide variety of framing systems that are ideal for the unique requirements of many religious buildings, educational institutions, and municipal facilities such as fire stations. Kirby metal building systems are even cost-efficient solutions for industrial buildings requiring large clear spans, cranes, and mezzanines.